Often selecting the perfect window treatment can be a daunting task. Not only must you choose colors, fabrics, textures, there's the measuring and installing. Incorrect measurement or installation of your drapes, valances, and blinds can ruin the look of your window. Here are some tips from designers at HGTV on how to get started on your window treatments. Read them all here. Bathrooms have unique requirements for window treatments: privacy, ability to handle moisture, while still looking attractive. This article from HGTV.com provides a ton of ideas and many sites to investigate to help you creative beautiful bathroom windows. See the article here. You will recognize some of these ideas from My Home Redux before. I've mentioned sheers on multiple occasions - light, elegant, easy - and have used two colors of sheers draped as a swag in my own living room. But there are many other popular styles of window treatments today ... all of which are also readily available in ready-made drapes. Read on from the folks at Style at Home to learn more. You'll notice that I write frequently about window treatments. Why? Because your drapes, curtains, and valances have a big impact on the decor, feel, and style of your room. 1) Use metallic fabrics. It can be sheers or heavy satins. But metallics are hot. Bronze, golds, coppers are all big. 2) Line your drapes with blackout fabric. Just like in a hotel room, this will block out the sun and save cooling and heating costs in summer and winter respectively. Of course, you'll save your privacy too! This trend is a bit new and is being credited to the "boutique hotel" decorating style currently in vogue. 3) Hang your window treatment from tabs or rings with metal grommets on the top of your drapes. This is a modern style but one that's very popular. In fact, at some retailers, it's hard to find anything but this type of drape (think Pottery Barn, Renovation Hardware, Crate and Barrel). 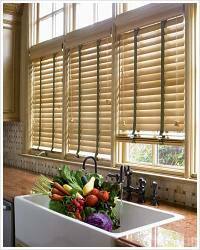 4) Adjust light and privacy using wooden blinds. Either white or wood, this is a popular feature for family rooms, living rooms, eat-in kitchens, and studies. Shop around as some faux (fancy French word for fake) versions are hard to tell from their real wood cousins and are much cheaper. Also, consider whether you want your blinds hung inside mount (inside the window trim/frame) or outside. Outside is easier to install (and measure) but inside mounted blinds offer a much cleaner and elegant look. Be sure your windows are deep enough though to hold the blinds. 5) Add trims and embellishments to the bottom and sides of your drapes. This enables you to add luxury as well as other colors to make additional patterns and room elements easier to coordinate in your room. When selecting window treatments, remember the impact and statement they can make in your room. Consider these trends to make your windows a showcase! Often single windows can be tricky. Even if there are more than one in a room, one window can prove to be the most complex. Take a look at these beautiful window treatments. Look at the styles, colors, and fabrics. Those three elements will provide the most inspiration as decorate your home and create your own stunning windows. See all 19 here. Here are 10 ways to dress up inexpensive drapes for a luxury, custom look. I especially like the scarf over the panels and the ribbons glued on as embellishments. Also, I have been stumped as to what to do for my son's sports-themed bedroom, complete with Chicago Bears bedspreads. When I saw the stencilled panel idea, I thought I could do that on a straight valance with the Bears front and center. Here's an 11th idea from me. If you find sheets, table cloth, or fabric that you'd like a window panels, simply cut it to length and attach to a pole using clip on drapery hangars (clip on one end, circular hangar on the other.) Fast and easy! See all 10 ideas at Better Homes & Gardens, here. This article is from I-Village and discusses blinds and shades. You'll be familiar with these but the writer provides good examples of how and where to use each for best effect. I personally love balloon shades - soft, traditional, and can provide good light filtering or blocking capabilities as well as insulation. Wood blinds - stained or painted white - are also very popular in decorating these days, especially in family, kitchen, and great rooms as well as libraries and studies. Check out all 11 treatments here. 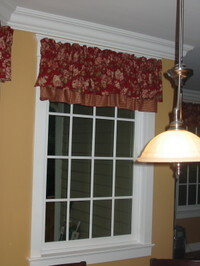 The consensus of experts is that drapery rods are to be hung at least 3 inches above a window - including the trim. If you have tab top drapes or are using rings, it should be higher so that the drapes themselves (below the tabs or rings) are still above the window. This has been consistently stated in all my research. But I have a problem. My windows are very tall, and I have crown molding around most of my first floor. I simply don't have the space. Frankly, I think the window and valance look fine as shown in the picture. 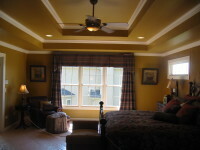 Now, I will admit that upstairs where I don't have the crown molding, my drapes would probably look better hung higher. So my final verdict on this advice: Where you can, hang your drapes and drapery rods above the window. But if you just can't, don't sweat it. Hang your window treatments as high as you are able with beautiful curtains, drapes, valances, or swags. 2) First decide how much privacy you need. If it's a bedroom or a bathroom, you need privacy. That can be achieved in many ways - shades, blinds, shutters - anything that blocks vision. The type will depend on the style of room. Shades can be roller or fabric type. You are not just limited to vinyl roller shades. Roman shades, balloon shades as well as wooden shutters or blinds work great. 3) Next decide if you don't need privacy, if you still want to block sunlight or the view (looking out or looking in). Perhaps sheers are the answers, but again, think about shades, blinds, and shutters. Often, this is enough. You may not need anything else. I have several room where the only window treatment is simply shades. Many rooms are great with just blinds or shutters. 4) Once you're ready to start looking for the actual window treatments - from blinds to valances - start with as much as you can do with pre-made curtains and drapes. It's faster and cheaper. That doesn't mean it needs to look cheap or poorly decorated. Coordinate colors carefully. Make sure you get the right sizes. Remember that fullness and quality fabric are the first indicators of luxury in window treatments. Also, try to use multiple layers. Double valances, long panels, blinds, shades or shutters. Don't go overboard but layers impart a luxurious feel, especially in dining rooms, romantic bedrooms, and living rooms. See here for some tips for luxury drapes . 5) Remember a simple key measurements to make sure your windows look their best. The width of your treatments should be 150 - 200% the width of your window. In other words, if your window is 30 inches wide, your valance or curtain should be 45 - 60 inches wide. Long panels should NEVER stop above the floorboards. They should come to the floor or even puddle on them for a very rich feel. Valances or toppers should follow the same fullness (width) guideline unless they are supposed to be the exact width (like a cornice). The length of your top treatment should be no less than 25% of your window height, preferably about 1/3 of the height. So if your window is 60 inches tall, your valance should be 15 - 20 inches long. You can layer your valance and stagger it underneath to create extra length AND extra layers. 6) Next, be creative with drapes or valances that you can make yourself. I love swags because they are so easy. Drape fabric over a pole. Voila. For some tips on how to make them, read this post of mine. 7) If you can't find or easily make something, you enter the custom drape stage. If you are handy with a sewing machine, you can save TONS of money making your own custom window treatments. Fabric stores carry drapery fabrics and most pattern manufacturers have patterns for many home decorating projects and window styles. If not, you'll need investigate custom options. I've ordered many blinds and shades from Smith+Noble which carries a large variety of fabrics and wooden blind options. They also offer options for valances, tops, and panels. While I wouldn't consider them cheap, it's better than going to a seamstress. You can also try American Blinds. I'm sure you can search and find more, including this online service I recently discovered at Fabric Workroom. 8) After you've exhausted all of those resources, you're on to a seamstress. Check at fabric stores, craft stores, and retailers that offer custom drapery services. Ask to see samples of the work and to get references if you're dealing with an individual. It will cost you, but the drapes will be unique and made to order. Window treatments make a big impact on a room. While they can be expensive, you can save yourself considerable money if you check out pre-made sources, tackle making some of the treatments yourself, and use your creativity. Window treatments can make a big impact on any room. It's great if you're handy with needle and thread. But what if you're not? How can you make custom window treatments without breaking the bank? Here are several great ideas.